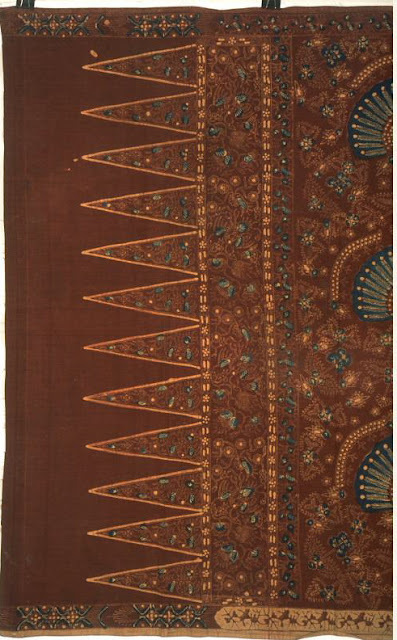 [Circa 1900-1925 Javanese cotton batik produced in Lasem. 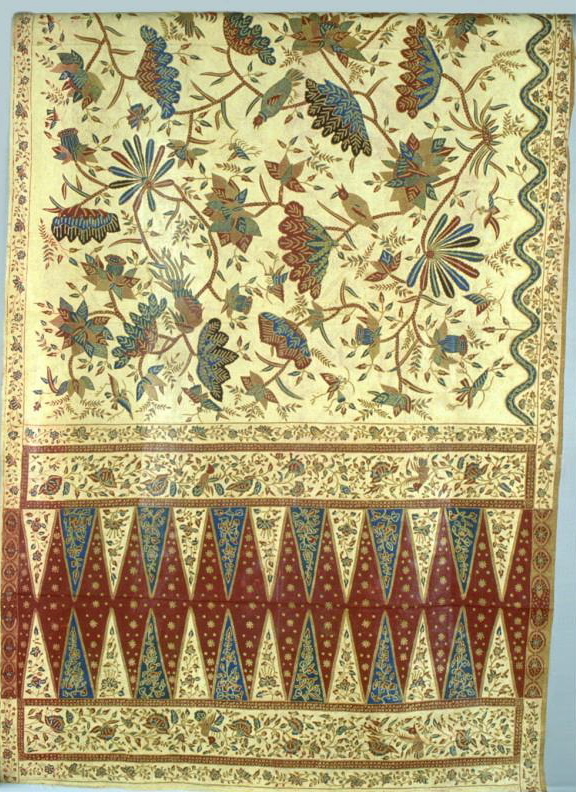 It might not be very evident in this image, but there's a touch of gold-leaf on this Indonesian batik cloth. It was designed to be worn by a woman (might have been a gift to a bride on her wedding day, according to the Asian Art Museum), so precious gold dust was applied only to areas that would've been visible when she had the sarong on. 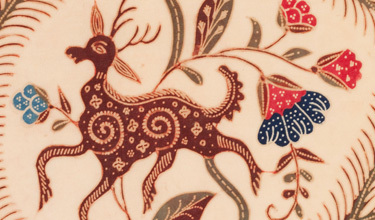 Curvy flowering branches and a red-blue-and-cream color scheme show the influence of imported Indian chintz. 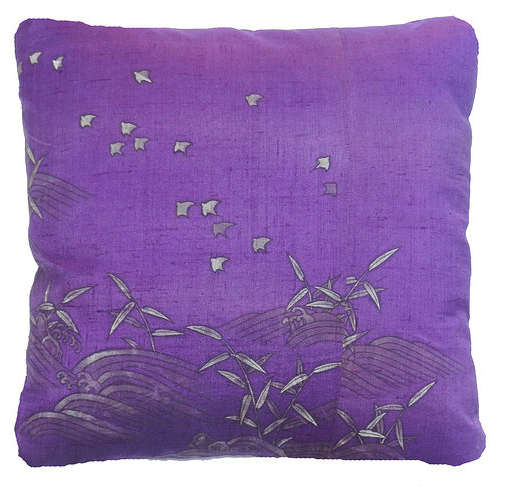 Also, if the birds or any other elements make you think of Chinese design, this fits because Indonesians of Chinese descent were in charge of most workshops in Lasem, where the batik was created. For an upcoming exhibition, Asian Art Museum curators have gathered together some exceptional examples of batik -- the complex resist dyeing technique, perfected in Java, which involves applying hot wax to cloth. Batik: Spectacular Textiles from Java opens November 2 in San Francisco. 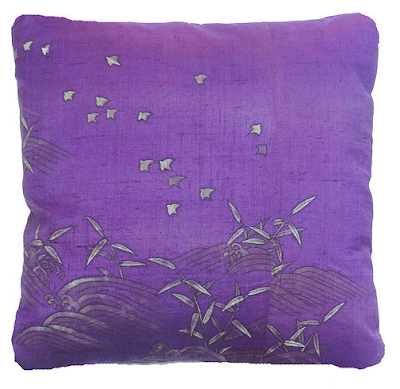 The pillow below isn't resist-dyed or from Indonesia; it's made from a mid-century painted Japanese silk and I was drawn to the lustrous purple while browsing newly added goods over at Pat McGann. Wow, Courtney, you are posting a lot of inspiring things this week. Loving the background story with the sarong: that bride would really sparkle on her big day. And with visits to both LA and SF next month, you are giving good advice for possible visits. Looking forward to visiting the Asian Art Museum! I was just going to post the same thing as Elsbeth - Courtney, you have really been on a roll! 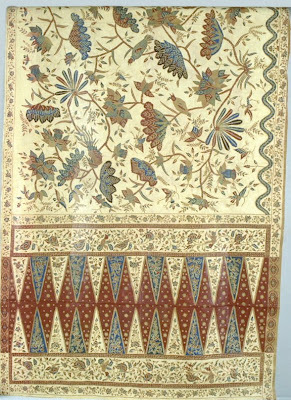 And one of the fascinating things is how popular South East Asian batiks have been historically here in Japan, used often for traditional dress. I'm occasionally lucky enough to find an antique scrap or two at the markets. Jacqueline -- I know you're always finding great things. And you probably already have it, but John Guy's book "Woven Cargoes" has wonderful images of just what you're talking about.